My oldest son Luca, who is 6 years old and in 1st grade, started playing machine-pitch AA baseball this fall in our town’s league. My neighbor, who also has a son on the team in 1st grade that is Luca’s close friend, asked if I would be his assistant coach. I, of course, agreed. So I bought Luca a new mitt on Amazon — a sick Rawlings Gold Glove that believe it or not was only $20 — and the season began. Now, I’ve been playing wiffleball with Luca since he was a toddler, and he’s got a strong swing and can throw the ball. But this is his first real season playing organized baseball, and at his age, catching is by far the most challenging skill to acquire. So whether we are having a back-and-forth toss or I’m throwing him grounders and pop-ups, I’m always pounding “gotta use two hands” into his head. That way, when the ball hits his mitt, it won’t fall out. Simple. For the most part, Luca tries hard to use two hands. And he’s made some great plays in the field because of it. And when he forgets to use two hands, he’s made some errors, too. All good, it’s fall ball, he’s still learning, and they don’t even keep score until the spring season. So it’s really an opportunity for Luca and all the other kids in the league to get a feel for the game, and practice their hitting and fielding. Every game is basically dress rehearsal for the spring. Here’s the thing with Luca, though. He’s a smart, awesome, athletic kid, but sometimes — like many little dudes his age — he thinks he already knows everything. And sometimes, he’s not the most coachable kid, especially when the coach is his father. Therefore sometimes, he thinks he doesn’t need to use two hands — he thinks he can catch the ball with just his glove. He doesn’t want to listen to his dear old Dad tell him what to do or how to do it. Yes, it’s happening already. But I think I proved to him the true value of using two hands last night. See, my friend Jon Jo blessed me with two tickets to the Knicks preseason game against the Wizards (thanks again Uncle Jo! ), and being that Luca is my oldest boy and my other two sons are a little too young, I brought him along to Madison Square Garden for his first live Knicks game. He was blown away the whole night — when we turned the corner onto 8th Avenue and saw MSG all lit up, when we sat down in our seats just in time for the starting lineup announcements, when Melo hit back-to-back 3s, when Porzingis caught a dope putback dunk, when Brandon Jennings did a crazy spin move, and when the Knicks pulled it out with a game-winning free throw in the final seconds of the fourth quarter. But the biggest highlight of the night didn’t happen on the hardwood. It happened in section 114. Now, periodically throughout the game, a group of Knicks City Dancers and crowd-hypers take the court during timeouts or game breaks and shoot t-shirts into the crowd out of slingshots and, for lack of a better term, shirt guns. And without hesitation, everyone gets up on their feet and screams down for them to shoot t-shirts up towards them. But it’s not easy to catch a shirt. There are close to 20,000 fans at the game, and they’re only shooting like 50 shirts max into the crowd at a time. The odds are against you for sure. Late in the fourth quarter, the t-shirt shooting crew took the floor for the last time of the night. And just like before, Luca and I stood up — along with everyone else in the arena — and screamed down for them to shoot a shirt up to us. But this time, the two seats in front of us were empty, because a father who had been there with his daughter — she looked even younger than Luca — left at the end of the third quarter. After two minutes of Luca urging me to keep yelling and screaming for a shirt, the guy finally took aim towards our section and fired away. It was coming right towards us! So I reached forward, extended both my arms over the empty seats in front of us, and boom — I caught the shirt with two hands. Luca didn’t even realize it at first, so I turned and showed him the grenade-shaped, taped-up t-shirt in my hands. I gave it to him, and we started going nuts, jumping and hugging like maniacs. I kept yelling “let’s go!” into the crowd as the people around us smiled (and probably hated a little too haha). 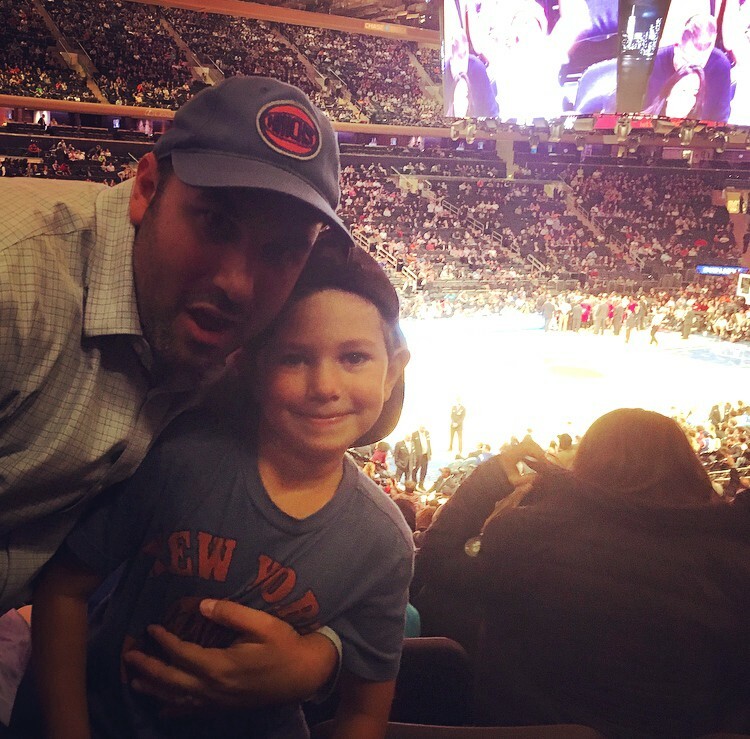 It was one of the most amazing moments of my adult life — I caught a shirt for my son at a Knicks game. Luca was in awe — he made me feel like it was the coolest thing he’d ever seen.